Imagine if your global business had “portals” in each office, allowing staff to teleport back and forth, and meet remote colleagues? Would that support your global company culture? 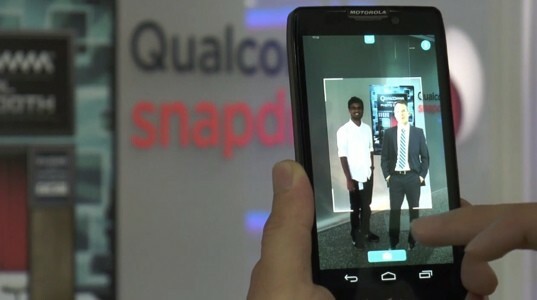 Qualcomm’s Virtual Photobooth App is a light hearted way to meet senior execs based in buildings far away! Qualcomm has almost 30,000 employees spread across 40 countries. Between us we speak almost 70 languages and come from well over 100 nations. So – truly global. Yet the heart of our business remains very connected to the ideals of our founder (Irwin Jacobs), and our main campus (San Diego). We are proud of this heart – and always looking for ways to help remote staff feel a little more connected to the main campus, and the leadership based there. Doing good? We certainly hope so. We have certainly had a lot of downloads, and positive comments. Good showcase? Absolutely. We have several of our partners and clients asking for their own! Would this help your organisation? What are you doing with mobile to support global culture? New in the job? Trying to get up to speed, fast? Qualcomm uses their in-house QC Lingo app to help new employees learn the top 100 internal jargon words as fast as possible!